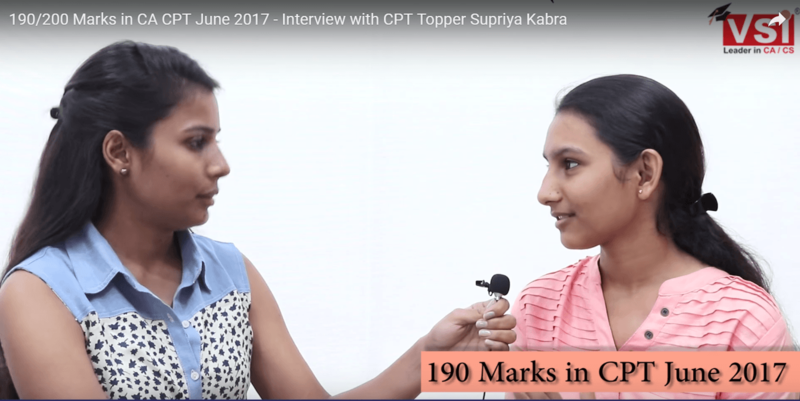 QSupriya Kabra, How did you react after your CPT result? I already had an estimated idea about my score, which was 180 plus, through VSI mock test papers. But scoring 190 was literally shocking. So I was dazed on listening to my CPT result. And I informed my parents and relatives regarding my result. So all of them were very happy. QWhat was your expectation about the result? On behalf of my performance in VSI mock test papers, And also from VSI memory based answer key after the exam, I was expecting between 180 to 185 in main CPT exam. But scoring 190 was just amazing. QWhat was your study plan? Teachers at VSI are very much experienced. They used to guide us about how to prepare for the exam, how much time should be given to a subject and accordingly I prepared for the exam. QTo whom you wanna give your success credit? First of all, I would like to say thanks to my parents. Secondly, R.C Sharma sir. He used to guide me in every aspect. I used to consult him every time I had any sort of doubt? and especially, during our 15 days revision time, sir used to call us every alternate day and after knowing our status, accordingly, he used to guide us about how we should proceed further. And thirdly, VSI faculties. They used to clear most of our doubt in classes but even after class, we could call them if we had any doubt. And they were always available for us. QWhat are your plans for CA Intermediate? The concept of CPT has completely been changed now. Earlier, CPT was completely MCQ based, but now CA Intermediate is on your writing skills. I am a class 12th zone topper. so accordingly I have self-expectation that I have to prepare well for CA Intermedia examination. VSI has very good past records like last 2 times they have produced AIR 1, Nikhil and Tanu Garg. So I also expect I can reach somewhere nearer to them. VSI experienced faculties and R.C. Sharma will guide us to accomplish our dreams. QWhat message do you want to give to the students preparing for CPT? If they have to score well, first, they should focus on VSI notes and ICAI modules and secondly They have to manage time and have to mold themselves according to the exam pattern. Till class 12th, they have prepared for subjective papers.but now they have to prepare for the objective paper but this is also until December, Thereafter both subjective and objective are going to take place. So accordingly they have to mold themselves by practicing a lot. Secondly, time is very short if you are appearing for the June examinations. So in 2 months, you have to prepare the whole course. Accordingly, they should manage the time and take the guidance of the faculty members.